A new US TV commercial for Diet Coke shows Taylor Swift writing her latest single ‘22’ – supposedly being inspired by the can of Diet Coke that the Grammy-winning singer-songwriter is seen enjoying throughout the ad. Filmed in Nashville, the TV ad – titled ‘Music That Moves’ – also features performances by Taylor’s fans singing and dancing along with the new song. “Taylor is a true artist, deeply involved in the full creative process, from writing to production to release,” says Stuart Kronauge, general manager, Sparkling Beverages, Coca-Cola North America. “The ‘Music That Moves’ ad shows Taylor in her natural element – penning lyrics that one day will speak volumes to millions of fans the world over … all while sipping on a Diet Coke. The commercial serves as a peek behind the curtain at an extraordinary day in the life of a true American superstar. “How (Not) To Write A Hit Song! 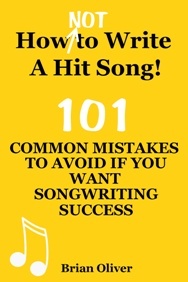 – 101 Common Mistakes To Avoid If You Want Songwriting Success” is now available from Amazon’s Kindle Store for only US$7.22 or GB£4.78.